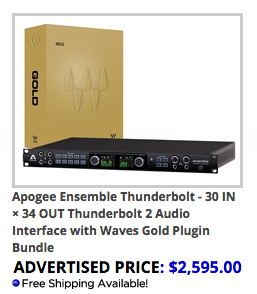 Apogee have announced a new partnership with Waves to offer either Silver or Gold bundles with purchases of Apogee Duet, Quartet and Ensemble Thunderbolt interfaces. 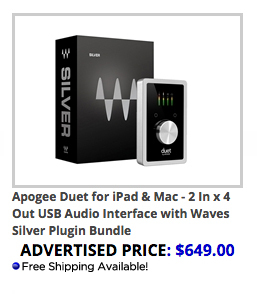 Customers that purchase Apogee products used, refurbished or from an unauthorized Apogee dealer will not receive Waves Plug-In Bundle. 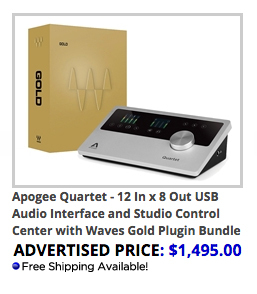 Customer must register the Apogee hardware product with a valid serial number and qualifying purchase date via Apogee’s website to receive Waves license code. PLEASE NOTE: THE WAVES SERIAL NUMBER AND SOFTWARE INSTALLER ARE NOT INCLUDED IN THE BOX. This does not include the Avid badged versions of these products. Shop Apogee x Waves Products at RSPE Audio!